Franco may have been a loathsome Fascist dictator, but he was no fool. In 1940, when Britain itself was under real pressure, he could have marched into Gibraltar, leaving Churchill with the very difficult decision whether to submit or defend. In early 1942, faced with a similar crisis over Singapore, Churchill abandoned the colony. Had Gibraltar fallen in those dark days, Malta might have also been lost and North Africa too. It was unlike the Great Siege of 1779-1783, when the British Navy was totally dominant. Gibraltar had been ceded to Great Britain "in perpetuity" under the Treaty of Utrecht in 1713, but Franco was pragmatic. He did not trust Hitler, had his own problems and realised Gibraltar under British control could be useful to Spain. Since those times, nationalist and more liberal Spanish governments have blown hot and cold over “the Rock”. From 1969 until 1985, the border with Spain was closed completely. Referendums were held in 1967 and 2002 on Gibraltar’s status quo as a British Overseas Territory, but unlike other far-flung remnants of the Empire, it is part of the European Union. The 2002 vote resulted in a 87.9% turnout with 187 people wishing to join Spain and 17,900 against. For the UK (including Gibraltar) referendum of 2016 the vast majority wished to stay part of the EU. Today, up to 10,000 people living in Spain traverse the border into Gibraltar daily for work. Neighbouring the airport is the town of La Linea which in 2015 had a recorded unemployment of 40.1% and is considered amongst the poorest in Spain. The nearest scheduled airport (other than Gibraltar) is Malaga, 80 miles away. There is a twice daily train service to Madrid that takes 5.5hr, or you can change at Seville. Morally joined to Gibraltar, it could prosper. 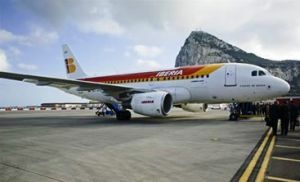 In 2006, with the Spanish PSOE (Social Democratic Party) in power, the Córdoba Accord was signed, ending discriminatory restrictions on civilian flights to Gibraltar International, including the prohibition of flights over Spanish soil, and the exclusion of Gibraltar from all EU agreements on air transport. This resulted in Iberia opening up services between Gibraltar and Madrid. A fine new terminal was subsequently erected actually on the border designed with two exits, one for Spain and one for Gib itself, rather like Basle – in France, but bordering Switzerland. Following the Spanish governmental change in 2011, it has never been finally completed nor a tunnel under the runway which would have stopped the congestion when the road is closed for arriving or departing aircraft. In spite of all its problems, Gibraltar Airport has grown and grown, in 2016 reporting 550,000 passengers, easily a record figure. The terminal works well. Spain continues to make noises over Brexit and seems to take liberties with its tiny navy of just two frigates finding time to wander into British waters. Spain holds on to its Moroccan enclaves of Ceuta and Melilla, part of the EU, with, we are told, the vast majority of the population happy with the status quo. Morocco makes political noises from time to time regarding the two cities’ status. Melilla has an airport and a three-times-daily services to Madrid. Ceuta exists with a ferry to Algeciras. Clearly, Gibraltar would make much more sense, or offer up competition. Tangier is linked to Gibraltar with limited air and sea links. Cruise ships have to be careful when scheduling Gibraltar. It is Barcelona or Cadiz first, and then the Rock. It seems to BTN Gibraltar is not something to be bargained with over Brexit. As with Franco, the status quo should remain. Perhaps the territory should become part of the UK proper with full representations in the House of Commons? Spain needs to have another think. Forget the politics. Think of La Linea and the whole region of the south west. Together with Gibraltar, it could forge a partnership for a prosperous future together. You can be sure the Brits will not be giving up the Rock, but there is a lot we can do for Spain. NOTE: Gibraltar (GIB) is an RAF-run airport that accepts civil aircraft including scheduled services, which RAF Northolt (NHT) does not. In last week's BTN contributor John Burke raised the topic of International Airlines Group (IAG) after Brexit because it combines British Airways with Aer Lingus in Dublin plus the two Spanish carriers Iberia and Vueling. Waterside, now IAG’s headquarters should not worry. Scandinavian Airlines (SAS) has been an anomaly for the past four decades, founded in 1946 as the flag carrier of Denmark, Norway and Sweden with the ownership split between the three governments. All three offer their own currencies, with Denmark and Sweden within the European Union. Norway belongs to the European Free Trade Association (EFTA), which also includes Iceland, Liechtenstein and Switzerland. The organisation operates in parallel with the European Union, and all four member states participate in the EU's single market. What ought to be clear pan-European skies are cloudy. Air Greenland continues to connect Copenhagen with the vast territory that was lumped in the EU along with Denmark in 1973 but broke free in 1985 – without penalty. Then there are the French-speaking islands of Guadeloupe and Martinique, which are classed as EU territories (just like Madeira and the Canaries), yet Air France, Corsair and the local Air Caraibes are far from the only carriers. The two Caribbean islands can also be reached by Air Canada, American Airlines and Norwegian, which even flies there from New York. Also allowed to land on these tropical patches of so-called Europe is LIAT which is based in the former British colony of Antigua. Air Caraibes’ destinations include French Guiana, yet another part of the EU, but open to Brazilian and Surinamese carriers. It is therefore ridiculous for Ryanair to warn Brexit could mean “no flights between Europe and the UK”. Would the Mediterranean tourism industry accept such a concept? It is not the first time the expansive Michael O’Leary has got his geography wrong, regarding London and Brussels. In 2009, the Advertising Standards Authority banned Ryanair boasting it was quicker than Eurostar because he left out the transfers for Stansted, 25 miles outside London, and Charleroi, 28.5 miles south of Belgium’s capital. That\'s correct David, I\'ve barely seen a mention of the overwhelming majority of Gib residents that voted to stay. I think it shows where their interests and loyalities lie. The same of course is true, to a lesser extent of all the other countries in the Brexit vote except little England. Sadly they\'ve made a decision that the other countries have to abide by despite not voting for it themselves and now they find themselves criticised if they consider independence. The hypocrisy is astounding. BTNews has become more and more biased in its reporting in recent months, to the detriment of the content I am afraid to say. If the Spanish persist in claiming Gibraltar through the EU ‘negotiations’, the British government’s retort should be that La Linea is invited to become British. That won’t happen of course. But actually my attitude to Gibraltar has changed. I used to support the will of the majority. But only 823 residents voted to leave the EU; the vast majority pledged their allegiance to ‘Europe’ rather than the UK. While I understand why they took that view, that makes them EU citizens first with Britain as an afterthought, so Europe (i.e. Spain) can have them. The 823 should be afforded the opportunity financially to move to the UK if they wish. As for Ryanair, too much time and effort has been expended already on putting that idiot right so I'll pass. I reported from Gibraltar on Franco's blockade. If ever the Rock becomes Spanish, then Morocco will demand Ceuta and Melilla. They are Spain's enclaves on the African coast - yet part of the European Union! !